This is the compound clutch pedal support tab for a funny car bellhousing. The base width of this tab is 1 1/16" and the thickness is 0.090". The hole size is 0.503". The base is cupped at an angle: on one side the height of the center line is 2.313; on the other it is 1.750". 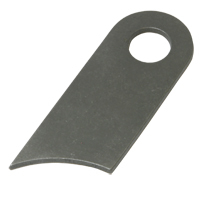 This part is included in the Alcohol Clutch Pedal Assembly, part # F-900.